Manufacturing isn’t just for men. Women are enhancing the industry one female at a time. From left to right: Rebekah Skinner of Mazak Optonics, Niki Lohmeier of Tempel and Vee Hassane of Afendi Manufacturing Corp. The skills gap is nothing new to US manufacturing but as it continues to widen over the next decade, 3.4 million jobs will be needed. With 60 percent of these jobs going unfilled due to the lack of skilled workers, this suggests that there will be a shortage of 2 million workers over the next decade. While redesigning and streamlining production lines and increasing automated processes, ironically this actually requires more skilled workers. But there is hope! Women total roughly 47 percent of US jobs, yet the manufacturing workforce is only made up of approximately 29 percent women. Women earn more than half of the associate’s, bachelor’s and master’s degrees in the United States. Women also hold more than half of all US managerial and professional positions. The manufacturing skill gap’s answer lies here. Manufacturing has not always been woman friendly or even encouraged women to consider manufacturing as a career path. But luckily there are organizations like Women in Manufacturing (WiM) who are promoting women to work in manufacturing. According to their recent survey, 74 percent of women working in manufacturing agree that the industry offers multiple job roles for women. The survey also shows that over 50 percent of women agreed that the manufacturing industry is a leading industry for job growth. But unfortunately, 68 percent of young women are not likely to consider a manufacturing career path. Women are an essential part of manufacturing and will continue to be in the future. I have been fortunate enough to chat with some of these women who are paving the way for successful careers in manufacturing. Is it nature or nurture that shapes us into the people we become? For Niki Lohmeier, Production Manager at Tempel, she has always been a hands-on person. Lohmeier explains, “When I was younger I played with Legos and K’Nex. I liked to build things. 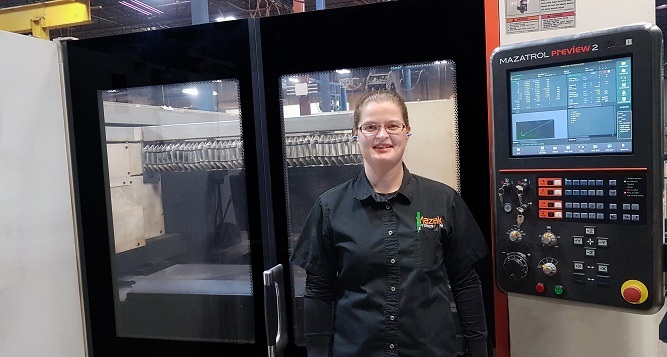 I was good at math and my father, an electrical engineer, recommended engineering.” Rebekah Skinner, Field Service Engineer at Mazak Optonics, was the same. “Since I was a kid, I liked to take things apart and see how they worked. I would put them back together and see if they still worked or see if I fixed them,” stated Skinner. For these two women, the manufacturing and fabrication industry were a perfect fit from the start. But sometimes, you take a different educational route and mold yourself into the manufacturing industry like Vee Hassane, President of Afendi Manufacturing Corp. Hassane explains, “My field of study was marketing and most of my past positions were visual merchandising in the retail sector but I ended up somewhere completely different. I had to let go of what I thought I had pictured for myself and embrace my new role and responsibilities”. Being a part of manufacturing does not necessarily mean you have to have the technical degree. There are many different ways to be a part of the manufacturing and fabrication industry. No matter what path you take, it can lead to a successful career. Women and men are different, but that doesn’t make it right or wrong, it just gives new perspectives which allows for a new opportunities. “Women bring a different approach and perspective to manufacturing. It allows us to bring more ideas and skills,” said Lohmeier and further explains, “Having both perspectives bring the best ideas together”. These different perspectives grow success for manufacturing. Lohmeier has really broken through in the manufacturing industry. She explained, “I was the first female to be in the North Press Room and now the first woman to be a production manager at Tempel. The industry is coming around.” Lohmeier was also a part of a Lean six sigma project, which included a “bake-off” project that compared three press manufactures where she tracked all of the data of the parts produced and how the presses performed. Lohmeier stated, “The group presented the impactful information and then voted on the best fit for the business. All of this helped us decide to purchase a brand-new press.” But this isn’t the only project that Lohmeier has been involved in which has impacted Tempel’s manufacturing. Lohmeier further explains, “I was a leader during Tempel’s Lean manufacturing initiatives, which included Kaizen events and process improvements. One project we worked on was setup improvements, which reduced set up time. We assigned specific jobs during the changeovers to specific people to get all of the jobs completed in a sequence within an allotted time frame. The biggest improvement was pre-staging setups before changing over the process. This eliminated people walking around trying to find things. Another idea implemented was improved office support processes. We eliminated duplicating tasks to close our books. These might not have been massive ground-breaking improvements, but they were small steps that helped the company’s efficiency,” Lohmeier said. Lohmeier shakes it up and helps make way for women entering the manufacturing industry. And it is always impressive when you are the first! Even without owning your own business or being a manager, you can still make an impact. Yet sometime it isn’t always easy, Skinner explains, “People think of machines as big, heavy and dirty. And women don’t ‘get dirty.’ It’s a mindset that is hard to overcome for other people.” Skinner doesn’t exactly know how she broke into this industry but she remembers a conversation with a General Manager of Customer Service at a previous job. Skinner explains, “He told me, I don’t think people will appreciate you as a service tech. Hearing that was devastating. I came out of school wanting to do technical work and field service work, and being told I wouldn’t be accepted is disheartening”. Even with the odds against her, Skinner has made her mark at Mazak Optonics. Michael Chase, Regional Service Supervisor, stated, “Rebekah is one of my most valuable engineers. Whenever I have an issue that cannot be figured out, she is the first and only person I would send. Without her I would be in a very tough spot. She is my rock star service engineer. In fact, she has a two-month long wait list for service from customers requesting her specifically. This speaks volumes about her skills and work ethic.” While Skinner is one of few women field service engineers, she shows how a career in technical field support is achievable and prosperous. Over three quarters of women in manufacturing report that the field offers interesting or challenging work that young women are seeking in their careers. Women also believe that the good compensation is a benefit of the manufacturing industry. With a major skills gap, women can be a solution to the lack of workers in manufacturing and fabrication. Encouraging and showing women that manufacturing is a great industry to work in is the key to getting them in manufacturing. “Yes, absolutely I would recommend manufacturing,” said Lohmeier. She also gives advice to women starting out their careers, “Try as many roles as you can in any company or industry where you can gain the most from the experience. And always apply for a job even if you don’t think you are qualified. The experience of interviewing will help you in many ways that you might not even be aware of.” Skinner also recommends manufacturing to young women starting out their careers, “I would recommend technical, service or other manufacturing jobs to women for sure. It can be a very rewarding experience solving a problem about why a machine isn't working and teaching customers how to better run their equipment. There is so much more to it than grease and dirt. 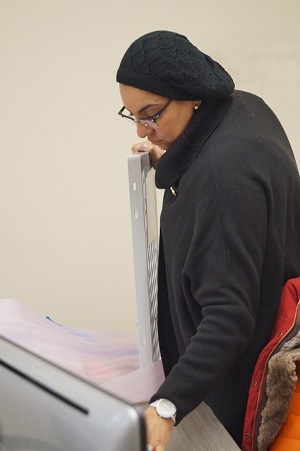 And best of all is making the customer happy.” Hassane gives a bit of a different approach to women looking to start in manufacturing, “I absolutely recommend manufacturing as a career. There are so many facets to the industry. As mentioned previously engineering, sales, marketing, information technology, human resources, there are so many fields of study that can impact this industry and it is my opinion that the advancements in technology will continually alter the trajectory and needs of the industry.” Manufacturing is beyond the shop floor and there any many ways women can enter into the industry. Even with women being a small percentage of the manufacturing workforce, they are already improving the industry immensely. With a major skills gap upon the manufacturing and fabrication industries, encouraging women to study engineering and other technical skills could help to reduce the shortage of 2 million workers. Women are capable of working in the manufacturing industry but we need to encourage them that they need to be a part of it. Don’t just sit back, inspire and motivate the women around you today. For more information on how to get involved, check out the Women in Manufacturing website.